This canvas is one of a group of “souvenirs” (recollections) that Corot painted towards the end of his life in which he combined an observation of the French woodland landscape with recollections of various places in Italy. In these works Corot aimed to express the emotions aroused by the contemplation of nature rather than to depict a specific place. Solitude was painted a few months after the death of his great friend Constant Dutilleux and the painting is imbued with an air of melancholy expressed through a harmonious combination of greens, blues and greys. The woman in the centre of the composition is a modern reinterpretation of the personification of Melancholy, seemingly evoking a Golden Age that has now passed. Exhibited at the 1866 Salon, Solitude was acquired by the Empress Eugenia de Montijo for her private collection. The Solitude was one of the two paintings Corot presented hors concours to the Salon in 1866. The second was entitled The Evening (R 1637, unknown location, also known as The Feast of Bacchus). 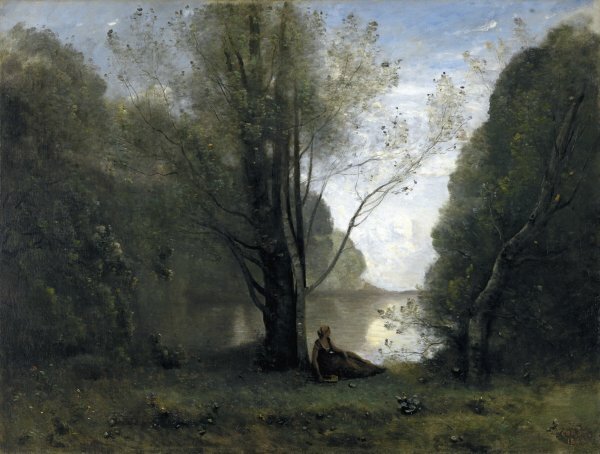 With The Solitude, Corot once again shows that his vision of nature was quite different from that of his contemporaries. Rather than Rousseau's naturalistic style or Courbet's realistic representations, Corot preferred painting a nature which encourages poetry and bucolic reverie. A long itinerary led him to this form of painting: the subject, an indispensable justification for the depiction of landscapes in the 1820's, gradually moved to the background, allowing greater space, in the decade of the 1840's, to nature itself and, in the following decade, giving it almost entirely to the landscape. The Salons of 1851 and 1859 were in this respect the decisive turning points and truly marked the transformation of Corot's different styles. This painting belongs to a genre called, since the 19th century, «Recollection». It would be necessary, in order to understand it properly, to retrace the history of outdoor painting. Corot appears at the time when observation replaces imagination, and this evolution is paramount in order to understand his personal career, perfectly integrated with the movement of neo-classical landscape painting. Following the example of all his colleagues, Corot brought back from Italy, where he stayed from 1825 to 1828, over one hundred studies painted outdoors, which would later be used to compose the paintings in his studio. One study could generate many variations, sometimes ten or even twenty years later. Corot simply took landscape painting a little further. He worked that way all his life and, from the 1850s, completely recomposed landscapes based on the remembrance of studies painted in different periods of his life, exactly like a musician who keeps all his compositions in mind and can play any piece on request. This is the case of The Solitude, which does not represent a particular place, but is the fruit of the imagination he let loose on the canvas in his studio in Paris. Corot's neo-classical training had taught him perfectly well to work indoors as if he were standing in the middle of the forest. If The Solitude. Recollection of Vigen, Limousin fits perfectly into a series of works which, from the beginning of the 1860's, marked the style which still today identifies Corot in the minds of the public and art lovers alike, it is also true that in this work there is a stylistic element which has hardly ever been analysed in general terms, and never in relation to this painting. What do we see? A woman sitting in front of to the spectator, with a classical hairdo, holding a lyre in her right hand and looking towards the back of the painting, to the point from which a beautiful brightness lightens up the work; the movement of the clouds, like in Lorrain´s works, begins in the horizon and seems to animate the whole painting.